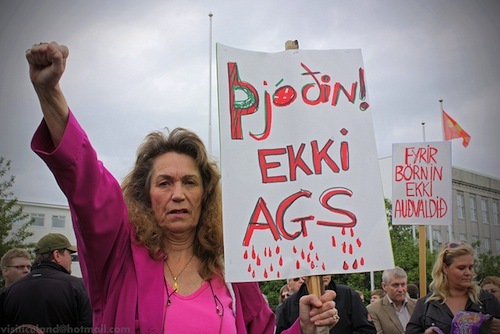 Note: this have nothing to do with the People of Iceland’s refusal to pay back UK and Netherlands. This is a second affair that came later and was about deposit guarantees, not sovereign debt neither foreign bank creditors. 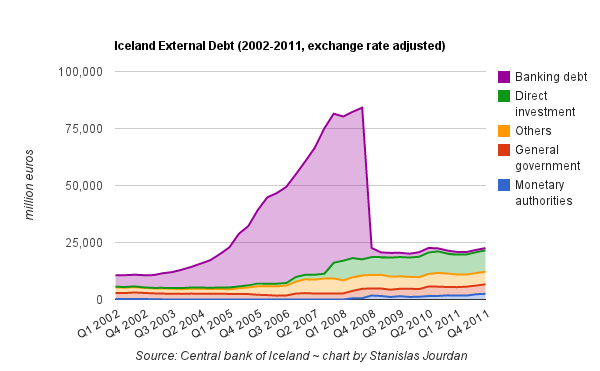 By the way, as I wrote earlier on this blog, contrary to what is being said, the Icelandic bank Landsbanki is indeed repaying this specific debt to the british and dutch authorities. As it should do. Could (and should) Spain do the same? Spanish banks simply have too much bad loans in their accounts. Because they won’t get their all their money back from over-indebted people, they won’t be able then to repay their creditors. This is why they need some fresh money from someone. So, from a balance-sheet point of view, writing down their external debt would be of a great help. One the one hand, it would reduce any need of recapitalization with taxpayer money ; on the other hand, it would make mortgage restructurings more acceptable for the banks. Furthermore, this is perfectly acceptable in terms of moral. After all, investors were promised yields as a counterparty of a risk. If this risk is to happen, why wouldn’t the investors lose their money like they mostly are today? So yes, Spain should probably do the same as Iceland regarding the write down of banking debt. Ready to go alone ? Second, the difference is that Iceland is an isolated Island that does not have much obligations towards foreign countries. Unlike Spain for the matter, since it is chained to Europe both by the common currency and through the European Union. An Iceland-like write-down would trigger huge markets turmoils. Are Spain’s partners ready to go for it? Certainly not. As the ECB did in Ireland under the pretext of preserving “financial stability”, central bankers will do anything it can to prevent spanish policymakers to do this. Others countries won’t be too happy neither, since their banks will take big losses (Spain has around €120bn of external banking debt according to BIS data) , thus provoking a domino-effect global markets, with a possible feedback loop effect on Spain. Is Spain ready to have a lot of ennemies around the World? PS: Don’t get me wrong: I am not saying Spain should not consider this kind of solution: this is probably the most fair decision a politician could take. But there are huge consequences that require to be addressed in the context of the eurosystem. But maybe some hybrid solutions can be agreed like debt-equity swaps and others soft restructurations.